Are you interested in learning more about the eternal friendship tattoo design? Many people are attracted to symbols of friendship for multiple reasons. Some look at the symbol as a way to connect themselves with a friend while others aesthetically like the way the design looks. If you're interested in getting an eternal friendship tattoo or would just like to learn some more information about the design, keep reading! In life, everyone meets people who they can call friends. These people are there to support one another when things get rough, are around to celebrate when things are going great and are there just to spend time with. They are caring, empathetic, passionate and loving. Friendship can be honest and personable or just casual. But no matter what, friendship is the source of great joy for many. For those who use tattoo designs to express something important about themselves or to remind themselves about something important in their lives, getting a tattoo symbol that represents eternal friendship can be a great symbol. 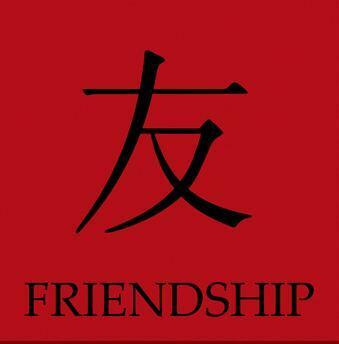 Chinese Symbol: A popular eternal friendship piece is the symbol in Chinese as shown here. The design is popular with those looking for simplicity with a touch of elegance. 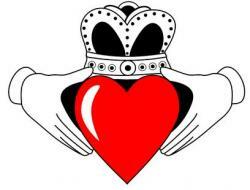 Claddagh: The Irish symbol for love and friendship, the Claddagh is a popular representation for friendship. The Eternal Friendship knot: The classic eternal friendship piece is simple: an infinity sign with a diamond over the mid-ground. The design is symbol but can be tattooed in different manners (such as colors). The Claddagh is an Irish symbol of friendhip. Both the Chinese symbol for friendship and the Claddagh stand for friendship and its roots. The classic eternal friendship design, however, goes a little bit deeper. The infinity sign in the tattoo is the first piece of meaning and is meant to show the way friendship will never end. It is eternal, always ebbing and flowing into itself. It can change but can never end. It is also a symbol of showing that one will get what they give and is a show of balance. The diamond portion of the design has taken more meaning in modern times. Diamonds, a symbol of stability and unyielding strength, are also one of the most expensive stones on Earth. Friendship, much like diamonds, can be the most valuable thing in ones life! If you and a friend both want to get the tattoo to commemorate your friendship, consider alternating the colors or leaving out elements that would be present in your friends tattoo. The design can be the link showcasing your friendship. A great way to make the idea more special is to surround it with more knot work designs. By doing so, the tattoo can take on other meanings. The design works great on the inside of ones wrist or the inside of ones ankle. The locations make the design look elegant and tiny rather than big and bold. The pattern would work well on the back of the neck or between the shoulder blades. If you're considering a larger piece, the design can work well as a part of it. As with most tattoo patterns, symbols of eternal friendship will look the best and matter the most wherever you think it would fit you best. It will always take on it's own meaning if it's something that is important to you and not just a nice design.